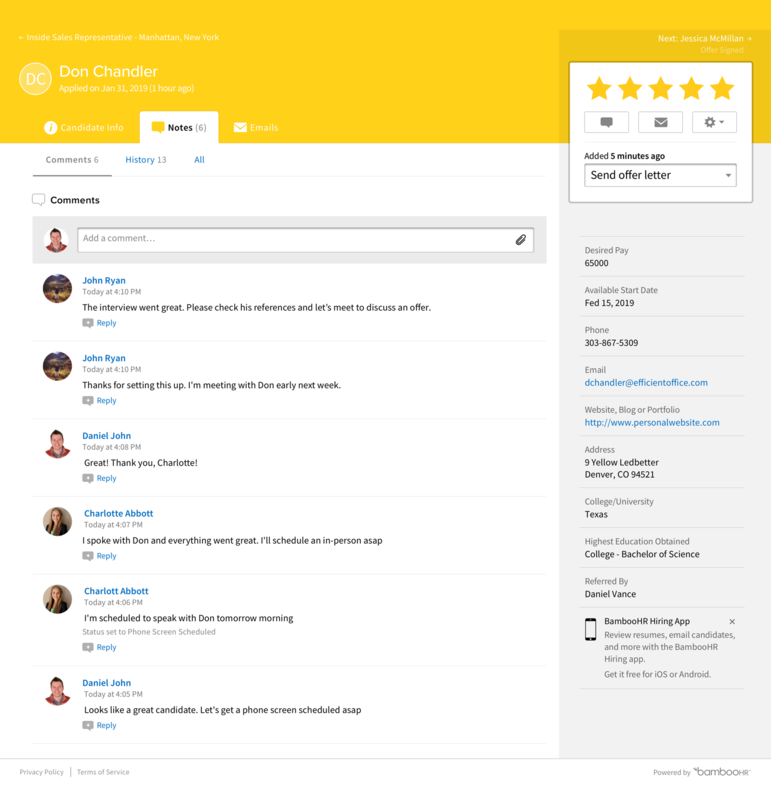 Modern recruiting tools help you find and hire the right talent fast. Get organized and get ahead of the game. Just like the early bird gets the worm, the swift and savvy recruiter nabs the best candidates, so employers want every advantage they can get. BambooHR applicant tracking software gives you that advantage, keeping applicant information organized through every phase of hiring so you can focus on finding the right talent for the job and creating a great candidate experience. A candidate experience they’ll write home about. 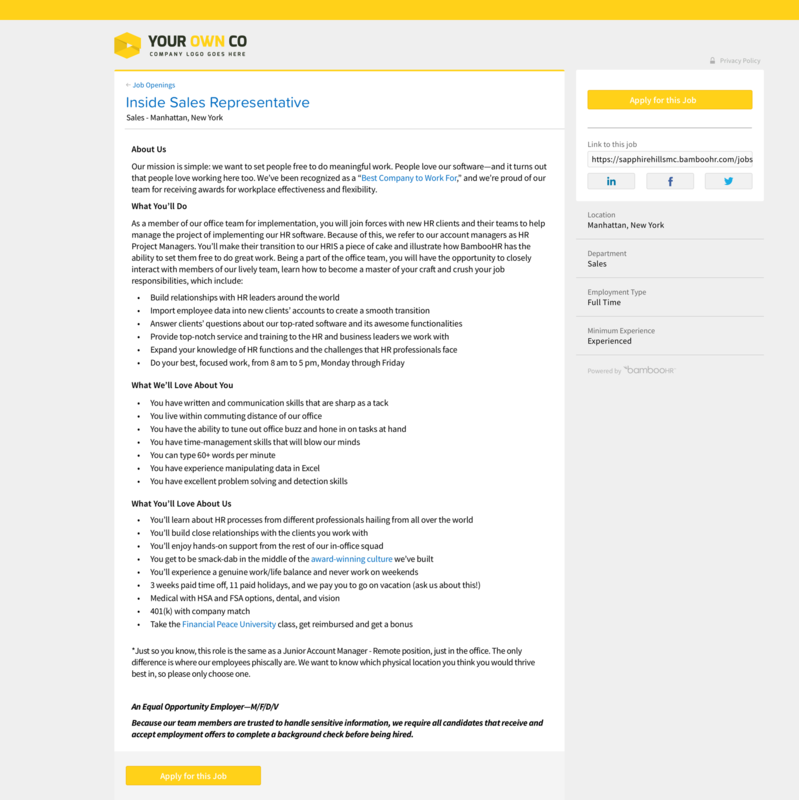 A great candidate experience feels seamless through all the stages of the hiring process. If applying for a job is difficult or communication is slow and spotty, you’ll lose star talent to competitors and damage your employer brand in the process. BambooHR makes the application process easy on candidates and ensures timely communication at every step of evaluation, so applicants feel acknowledged and informed, your hiring team looks like all-stars, and your reputation goes through the roof. It’s time to hire as a team. Collaborating on hiring is a cinch with BambooHR. Employers can easily add custom permissions to get input from stakeholders and team members at any stage in the hiring process. Automatic alerts and in-system messaging keep things moving without delays or drops in communication, and centralized applicant data pushes instantly to desktop and mobile to ensure everyone involved is always on the same page. Make an offer they can’t refuse. Quickly. When you find that perfect applicant, sending out an offer can’t happen fast enough. 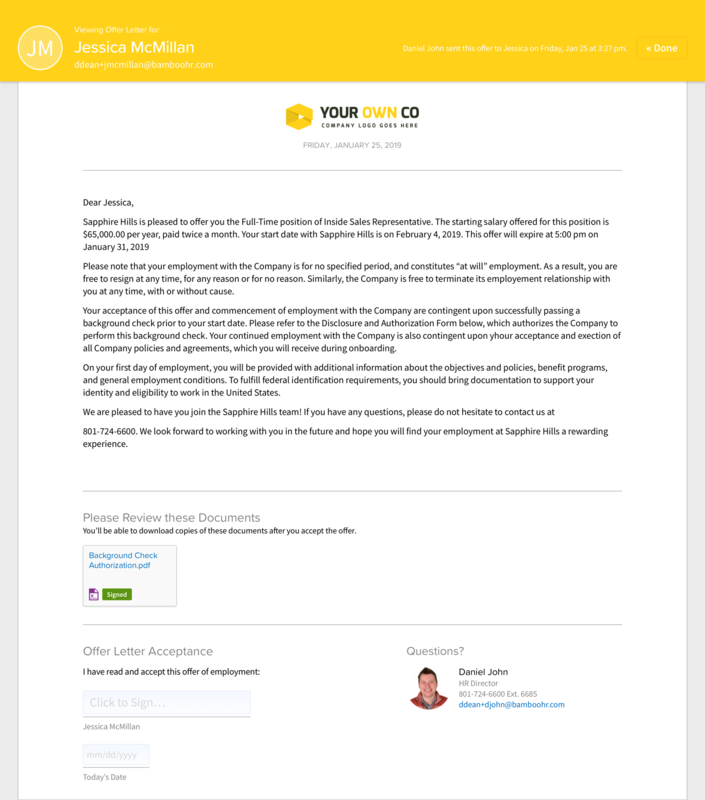 BambooHR makes it as fast as humanly possible—faster, actually—with auto-populating candidate info and customizable offer letter templates you can save for different positions, job types, and more. On the candidate side, electronic signatures make accepting an offer as simple as sending an email—no more hunting for a printer and fax machine. 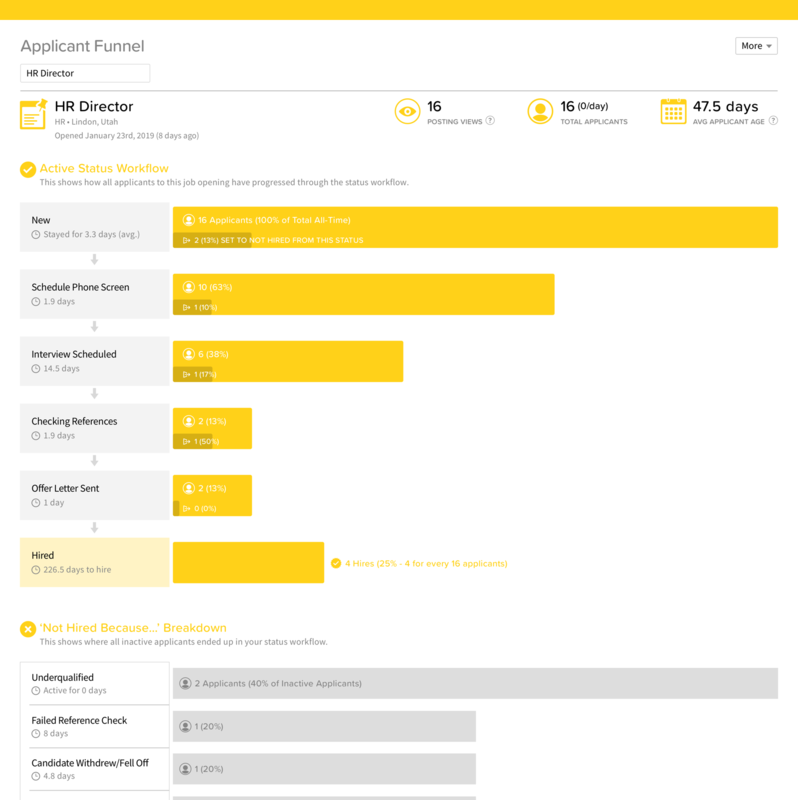 BambooHR® Hiring: our ATS app for iOS and Android. Recruiting doesn’t stick to a nine-to-five schedule, and it doesn’t care if you’re stuck in traffic. 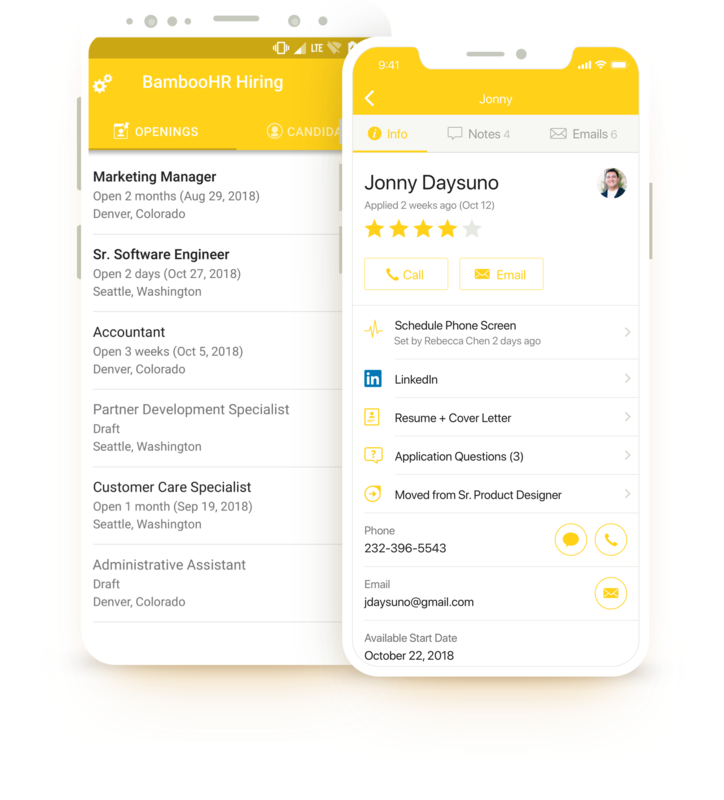 But thanks to the BambooHR® Hiring mobile app, your hiring team can post jobs on the go and begin reviewing candidates the instant they submit an application. Collaborators can see resumes, view responses to application questions, and provide ratings and feedback from home, the beach, or even the carpool lane. Just not from the driver’s seat, please. Applicant tracking that helps you hire better & faster. Improving your hiring process is hard if you're not reporting on where the issues are or how they’re affecting your time-to-hire. BambooHR applicant tracking includes reports and analytics to measure your hiring speed and identify bottlenecks—so you can hire more efficiently, improve the candidate experience, and maximize your employer brand. "BambooHR’s applicant tracking system (ATS) has given us the platform to compete for candidates who are not only more qualified but who also fit our company culture. Finding the right folks has decreased turnover and saved on training costs"
We asked the professionals who use our hiring app daily to talk about how BambooHR® works for them in the fast-paced, overwhelming world of small-business recruiting. It's freeing me up to do more of the stuff that actually matters in HR. 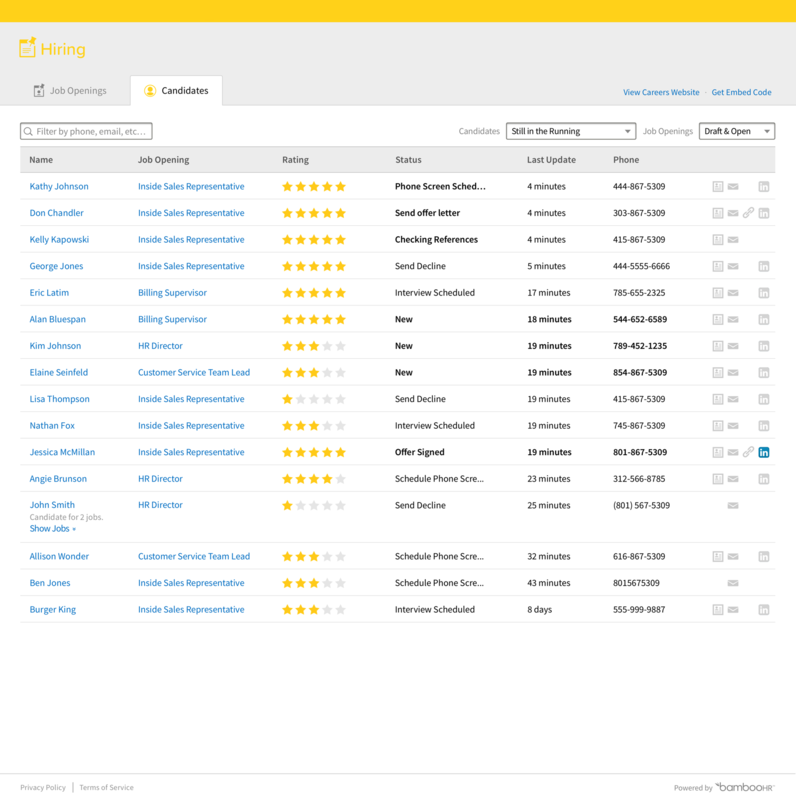 The power of the BambooHR applicant tracking system (ATS) in the palm of your hand. Manage all of your sensitive people data in one organized and secure HR database. Create onboarding programs that set your people up for success from the start.